If in real life, this boat would be a 37.5 footer boat. As for the boat itself, it runs very nice as you may see in its first sea trial at https://www.youtube.com/watch?v=ieXA40s6upQ. With a single screw and with 9.6 volts, it can achieve realistically looking speeds in the water. I though about going with a Lipo battery, but no 9v lipos are being offered in the market. To me, 7v is too slow and 11v could be too fast for realism. Plus, the extra weight of the NiMH battery helps with the boat stability on the water plus these are cheaper. Due to the lack of fittings in the market for this type of boat, including realistically looking seats, air vents and windlass, I got some custom made 3D-printed parts out of real life pictures made at a very affordable price from a supplier in Australia. I'm so happy with it that I'm currently in the process of using the same type of hull for another boat, these time inspired in 1970s Bertram yachts. It will go with an MTroniks 400 brushed motor, which is lighter but achieve higher RPMs. Hi Bruno. 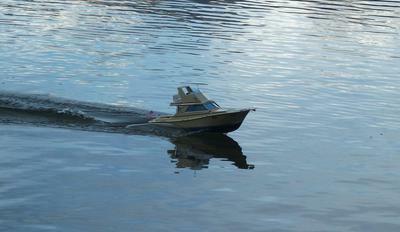 That's a great little build & looks nice in the water, I watched it on youtube & she gets along very nice. keep on with the boat building it's a good hobby. I plan to build another boat this winter, haven't drawn up plans yet but I will get to that soon, Another work boat I think I am familiar with them & how they operate around the 1.5 meters. they look good on the water.Good luck with your sailing. Thank you for your compliments! As a beginner, your comments are really encouraging. My goal is to attain a fun boat without sacrificing realistic details and performance. 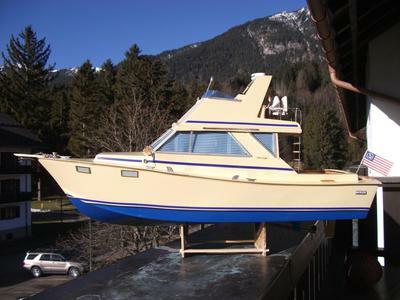 I obtained the fiberglass hull, including the bare cabin and flybridge, from http://www.modelsbydesign.co.uk/model_boats.aspx Unfortunately, I have no plans for it. However, the hulls are still under production per order for approximately $96 (£60). It worth every cent I paid for it. You can find it almost at the bottom of their webpage. Besides this one, they offer a nice variety of hulls. Rarely enough, they have another sport fisherman hull, that one of 30 inches. My particular hull came with no windows. It allowed me to go along with my imagination and with the pictures I had on hand. You can find my source of inspiration at http://www.network54.com/Forum/424840/thread/1245514041 I used a Dremel tool for the cutting. 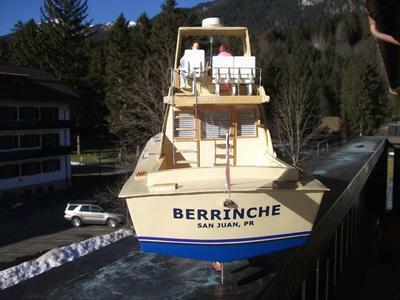 As for the flybridge, I found it a bit narrow in contrast with a real-life scale boat, but it was still workable. Besides making a very stable, solid and light platform on the water, I believe it can definitely be used for a static model due to its cavernous inner space. In the case of the custom-made 3D fittings, I got mine through http://www.modelboatsandfittings.com/content/php/3D%20Printing.php Very affordable and quick service. 3D printed your own features? WOW! And it is beautiful... hopefully it will be a family jewel for generations into the future! I build static models, would love to add this one. Where can I get a set of plans. Another great execution, Bruno. Thanks for your contribution and inspiration!